Nityo Infotech Services Pte Ltd is committed to comply with the RBA code of Conduct. 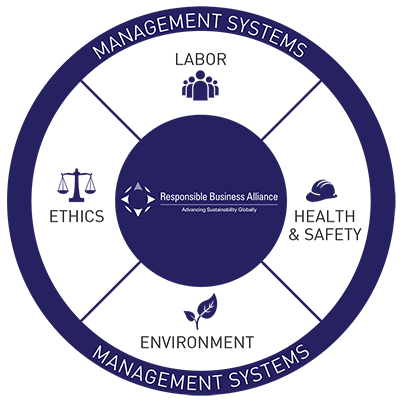 The RBA Code of Conduct is a set of standards on social, environmental and ethical issues in the electronics industry supply chain. The RBA Code of Conduct is a set of standards on social, environmental and ethical issues in the electronics industry supply chain. The standards set out in the Code of Conduct reference international norms and standards including the Universal Declaration of Human Rights, ILO International Labor Standards, OECD Guidelines for Multinational Enterprises, ISO and SA standards, and many more. The latest RBA Code of Conduct version 6.0 was ratified in 2017 and went into effect on Jan 1, 2018.